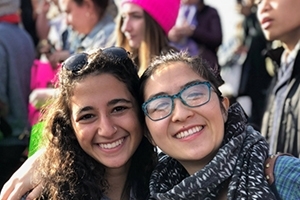 CAS Students Reflect on 2018 Women’s March CAS students share perspectives on historical march. On January 20, 2018, people across the globe gathered to stand up to injustice and raise their voices together at the second annual Women's March. We asked CAS participants one simple question: Why did you march? "The 2018 Women's March represented the power against a common enemy. During the past year, I have never seen so many people express themselves politically, including myself. Since the inauguration, I have become more outspoken and direct about my social and political views. Attending the march signified my participation in the revolution to view everyone as equals. Personally, the Women's March reignited my resistance against, racism, homophobia, sexism, and xenophobia." "When the organization Zioness Movement reached out and asked for people to lead a contingent of progressive, Pro-Israel Jews at the march, I couldn't refuse. I organized a group of people whose values reflected my own and who also felt pushed out of the Women's March, last year. I marched with this group to show that Jews have always been on the front lines of social justice movements and that Jewish self-determination and progressive values go hand in hand. I marched to show that Zionism and progressivism, that Judaism and feminism, are not mutually exclusive, and are in fact complimentary. I am proud to have brought Jewish voices and values to the march with me this year and hope to do so again in the future." "Initially, I forgot about the Women's March this year, but my mom reached out to me, explaining how important it is that I come out and stand up for my rights. She has been an outspoken feminist her whole life and has taught me to always stand up to injustice. I ended up going to the Women's March with my two male roommates, who are just as outraged by this administration as I am. I am proud to call them my friends as they stood in solidarity with all women." "I attended the Women's March this year and last. Both were incredibly moving; however, each had its own unique qualities. I deeply appreciated the people I met and the general feeling of togetherness the marches evoked. This year, I found the most fascinating part of the march to be the conversations I had with people around me. Those discussions were my opportunity to delve into issues with more nuance, and I learned a lot from them." "I attended the Women's March this year because I wanted to make history for the second year in a row. It's so amazing to be able to be a part of something bigger than all of us. The Women's March shows the rest of the world that we will no longer sit around and wait for things to improve. Instead, we're taking the world by storm, and I am so proud to be part of the movement."